1. What is included in your wedding ceremony rate? Any consulting that we do to select the ceremony music. We can do this via phone, email, or if possible in person at my home studio with my harp. 2. How do I secure your services for my date? In order to reserve a date and time, I require a deposit and a contract signed by the client. Once an interested client requests a contract from me, I will "tentatively" hold the date and time for up to seven business days to give the client time to send the deposit/contract to me, and the status of the booking is pending. After seven business days, I can no longer even tentatively hold the date and time for pending bookings. The date is officially reserved upon receipt of the deposit and contract. 3. Does the client need to provide anything for the performance such as a chair, light, or music stand? I bring all of my own equipment: harp, bench, music stand, and if needed, stand light and amplification. My harp is set up so that if needed it can be amplified with either my own amp, or I can also plug into most venue PA systems and have my own cables to do so. My amplifier can also run on battery, so an electrical outlet is not required. 4. Can you perform with other musicians for weddings? Yes. I have worked with numerous vocalists, organists, and instrumentalists for wedding ceremonies. Most of the time, only a brief rehearsal the day of the ceremony before the prelude music begins is needed. The harp sounds gorgeous on its own as a solo instrument, but also sounds lovely with other instruments such as voice, violin, trumpet, and cello. 5. Will you perform outdoors? Yes, I do perform for outdoor events and ceremonies and I do not have any special requirements or extra charges in order to do so. However, in the event of rain, I do require some sort of covering, tent, porch roof, or shelter over me because the harp or any wood, string instrument cannot get wet. If a covering isn't available during an inclement weather situation, than under no circumstances will I perform outdoors, and an alternate indoor site must be available. 6. Will you learn a special request song for my ceremony? Absolutely! I love learning new music, so I don't mind learning a special request song for your ceremony if you would like something that you don't see on any of my song lists. I do require some notice beforehand, and sheet music for the song must be available. If a harp rendition isn't available, I can play from piano music or lead sheet. 7. I have no idea how to even begin going about selecting my wedding music. Will you help me? Unlimited music consulting is included in my fee. This includes in person with the harp, phone, or email consultations. I also have song lists that upon request I can email to my clients to give them a "place to start" looking. I have played everything from traditional and classical music for weddings, to very non traditional music. The harp is an extremely versatile instrument, and it lends itself to many different types of music: classical, jazz, movie themes, love songs, rock, country, Christian, Celtic. 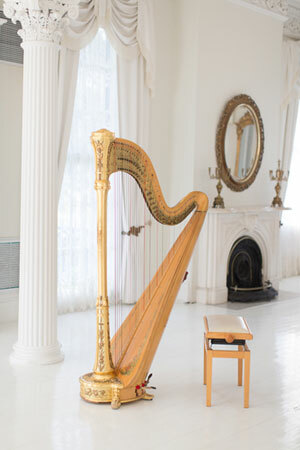 The harp's versatility is one of the things that I admire most about the instrument.